I acquired a curious taste for C.S. Lewis some years ago which helped me in reading and reasoning. I also found G.K. Chesterton at that time, and the two together took a lot of my time. I never got the same satisfaction from Tolkien., not even from his slimy and demonish Lord of the Rings. Having visited Oxford, England a few years ago, I enjoy the history and the pictures. My sister (Debra Conley) and I ate at The Eagle and Child, a later gathering place for these Oxford Inkings. 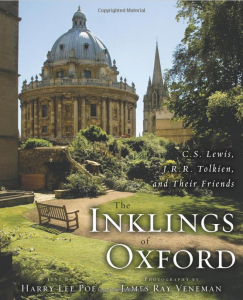 Actually, this “think tank” of literary writers called “The Inklings” was one of a few that Lewis and Tolkien organized. Attendees included C.S. Lewis’ brother Warnie, Owen Barfield, Nevill Coghill, Hugo Dyson, Adam Fox, Charles Williams, and even Dorothy Sayers.